Do What You Can. It's the Least God Expects of You! Our recent move into a new home and new neighborhood has presented itself with a few challenges. This differences are especially highlighted given where we used to live just a little over a month ago. 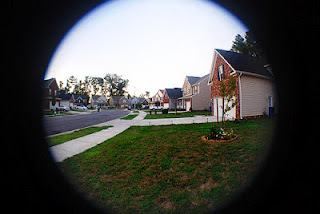 We went from a neighborhood - or "the hood" as it was affectionately referred to - where people lived outside and only slept inside...to a neighborhood - or "white suburbia" as my kids call it - where you only see neighbors for a few brief seconds. That's usually as they wait on their garage door to open. And then they drive in and shut it behind them. It's an interesting life here where homes are like caves. To be sure, they emerge on the weekends, usually for lawn maintenance. That's where the point of this post enters the scene. You see, I live in a neighborhood where we have an Home Owners' Association (HOA). Some see them as a modern form of the Gestapo, and perhaps there are legitimate examples of this. But in our neighborhood it more or less feels simply like a group who are attempting to protect the investment interests of homeowners. 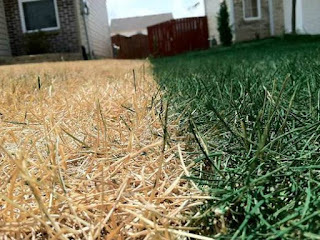 And that seems to start with our lawns. Right now, I have one of the worst looking yards in the neighborhood. I am renting, though I have a sneaking suspicion that such is frowned upon here. The previous renters did not appear to give a good reputation to the term "renting". They seriously let the front yard go to the dogs...literally. I have more weeds than grass, I think. And the second week I was in the home I got a letter from the HOA telling me that I needed to weed my front yard. Really? Here's the problem. I'm on what is probably the strictest budget I've been on since I was a college student. But I'm paying more now for a rental home than I ever have in my life! It's an awesome home, and more importantly, my wife loves it. But lawn care is an important part of this neighborhood, evidently. So what's a guy on a strict budget supposed to do about lawn care when there's no money to spend on it? In short, do what I can. That's the least that's expected of me. Despite the fact that I have 2 high-dollar lawnmowers in my garage that don't work, I drove across town to my friend's house to borrow his lawnmower. I folded the handle down, shoved it in the back of my 2005 Kia Sedona minivan, pulled it out, filled it up with gas, and cut grass for about a half hour or so. I then delegated the raking of the scraps to three of my kids, who piled the leftovers in the back yard for a starter mulch pile. The next day I did some weeding in the front yard, which seemed to leave several brown bald spots throughout my yard. Hmmm. Now it looks a bit worse. Each morning I'd say I probably spend about a half hour outside in my yard...pulling weeds, trimming hedges, raking, sprucing, doing pest control, etc. And then about once a week I spend about a half hour to an hour in my back yard...pulling weeds, doing pest control, prepping a flower bed along the back of the house, etc. 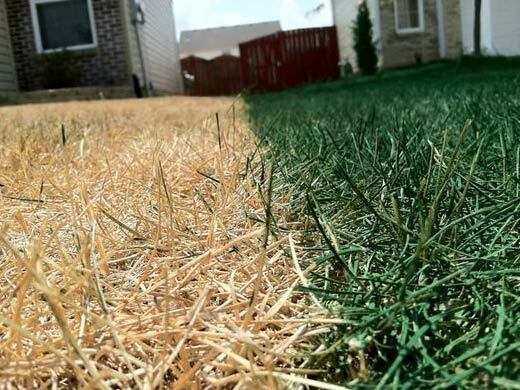 I don't have a dime to spend on weed sprays or fresh sod or even fertilizer. But what I do have is time. And with that time I can do small things that keep the appearance reasonably nice. It's acceptable enough that neighbors don't drive extra slow by my house wondering who the new rednecks are that moved into their white suburbia! This reminds me of that story Jesus told. You remember. It was the one about the three dudes who were given money to invest while their boss was on an international, long-term business trip, getting a new deal signed that would grow the company. He entrusted his #1 man with a large sum to invest. And he doubled his money by the time the boss got back into town. He also entrusted his #2 man with half the amount of the #1 guy. And he too doubled his money by the time the boss got home. He also entrusted his #3 man with a small amount. But he turned out to be the #3 man for a reason. He didn't do anything with what his boss gave him. Instead, he dug a hole, buried it, then dug it back up when the boss got home. He was so proud that he hadn't lost anything. Hmmm...the boss is thinking, while scratching his head with a totally bewildered look on his face. "You didn't even do what you could with what I gave you. At least you could have attempted to earn some interest somehow!" Following Jesus can often be made complex by preachers, theologians, seminary professors, and well-meaning church leaders. But Jesus mostly kept things simple, didn't He? Love your enemies. Do good to those who hurt you. Go preach the gospel. Love your neighbor. Give food to somebody who's hungry. Visit people in prison. Simple things. Simple things like, do what you can with what you've got. That's the very least Jesus expects of any of His followers. This makes what they don't have largely irrelevant. The one who is found faithful with the little bit they do have will be entrusted with more. And the one who is found unfaithful with that little bit will have that little bit taken away from them. Pretty simple. Whether he was a follower of Jesus or not, I don't know. But Teddy Roosevelt got this concept. 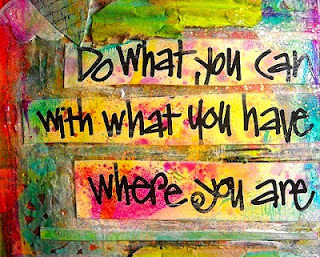 Among many famous saying is this one: "Do what you can with what you have where you are." And then there's John Wesley, who was a follower of Jesus. He got this concept too, as is most famously found in his quote: "Do all the good you can, by all the means you can, in all the ways you can, in all the places you can, at all the times you can, to all the people you can, as long as you ever can." I wonder then what changes can be made in the local church to help people follow Jesus along simpler paths. Maybe preaching a simpler gospel? Maybe just preaching the stuff Jesus said, without too much emphasis on the exegesis of it all. Or maybe doing the stuff Jesus said. It's amazing to me how many Christians have been following Jesus so long and yet seem so perplexed by the simple things He told us to do. It's almost like our first-world, westernized culture has trained us to think in nothing but categories of complexity. I dare you to talk about feeding the homeless and you'll find all sorts of strange reactions, usually from those who want to plan it to death, and then from those who act like they'll get "cooties" if they touch a homeless person. The gospel frees us from such complexity. It shows us that Jesus simply expects us to do what we can with what we have. Some people want to talk about doing great things for God, like living among the Pygmies of Africa in order to win them to Jesus. But they can't even walk next door and meet their neighbors, or talk to people normally at the community swimming pool. Jesus would have us to flip our worldview upside down, almost like an hourglass. We can stare at all the sand at the top of the glass and look at it as some complex load of responsibilities and burdens, which usually leaves us wondering how we'll do everything that we feel like we're supposed to do with so little time! Instead, turn the glass upside down, and think about doing what you can with what little bit you do have...with what little bit of money you do have (the disciples were broke but turned the world upside down)....with what little bit of time you do have (Jesus only had three years and look what He accomplished! )...with what little bit of house you do have (Paul ministered to countless people from a tiny room during his house arrest)...and with what little bit of food you do have (remember the little boy with five pieces of Pita bread and two fish?). Do what you can. It's the least Jesus expects of you! About the Author: Rob is a entrepreneur in Woodstock, GA, where he envisions and pursues missional-shaped business for the kingdom. He and his wife Sherri have been married for 18 years and together have three sons and a daughter. Rob believes the mission of the gospel is summed up in four simple phrases: know God, obey Jesus, make disciples, and plant churches. This is the pursuit of his life, as well as the point of his blog.